Be prepared! Follow safety guidelines, wear protective gear, and always bring plenty of water. Tell a responsible person where you are traveling and when you will be returning. Do not go alone. Consider riding with a club. Supervise riders younger than 16. Parents are responsible for their children’s safety. Know your vehicle. Read the owner’s manual. Check your vehicle before each trip. Take an off-highway vehicle safety and mechanical training class. Tell friends and family where you're going and when you plan to return. Carry a bright trash bag or a silver-sided space blanket. Equip your tow vehicle with a survival kit, with extra water stowed. Check fan belts, hoses, coolant level and all lubricants and fluids. Make sure the jack is working properly. Carry extra water, a flashlight, blankets, flares, first-aid kit, cellphone and snacks. Bring extra clothing, such as rain gear, a sweater and pants. For sun protection, make sure to bring sunglasses and sunscreen. Pack a sharp pocket knife and water purification tablets. Bring waterproof matches, lighter, magnesium bar and flint. And remember: Water, water, and more water! When traveling backcountry throughout Arizona, we all have a responsibility to the environment, to others and ourselves. Practice minimum impact and common courtesy. Using the backcountry for solitude, recreation, and adventure is an Arizona tradition going back hundreds of years. Everyone using the state’s public lands should do their part to ensure that these lands remain available to future generations to enjoy. Many areas attract a variety of different kinds of backcountry users. Regardless of what mode of travel you choose, we all have a responsibility to the environment, to others and ourselves. Practice minimum impact and common courtesy. Planning and common sense will improve your backcountry experience. Travel within the ability of your equipment and your fitness to handle changing weather conditions. Use only trails and routes that you know are legally open, and are dry enough to be suitable for travel. By choosing your time to use the backcountry, such as early morning or weekdays, you can avoid crowds in high-use areas. Common courtesy will go a long way toward ensuring a pleasant experience for others as well as yourself. Good practices on the trail and in camp preserve the environment and our privilege of continuing to enjoy our backcountry areas. The guidelines below were developed primarily for those who venture on to roads less traveled with a four-wheel drive vehicle. These guidelines also apply to anyone who travels into the backcountry, even where four wheel drive is not necessary. Always tell a responsible person where you’re traveling and when you’ll return. Give them a specific map, if possible. Don’t go alone. Two heads are always better than one and so are two backs, if labor is required to free a stuck vehicle. A second person also can be a great help guiding a driver through tight spots. If the trip will be extremely difficult, try to take two vehicles. Two vehicles can help one another out of bad jams. Water, water, water. Take at least one gallon per day, per person, as well as five extra gallons. If all else fails, at least you can stay in good condition for several days with enough water. Someone must stay with the vehicle if it’s stuck. A vehicle is much easier to find than a person on foot. Walk out for help only if you know exactly where you are and how far it is to help. Know your vehicle. Try out your vehicle in easy places until you know it well. Take a four-wheeling class. Read the owner’s manual. Use common sense. If a road looks too tough for your skills, it probably is. If you get in a bind, don’t panic. Stop the vehicle, get out and explore a little. Your good sense often will tell you how to get out. Proper Vehicle Training is recommended for all users. Parents are responsible for their children's safety. Make sure your kids ride with only approved safety equipment and have been trained to ride. The ATV Safety Institute ATV RiderCourse provides hands-on training in basic techniques for riding an all-terrain vehicle. If you recently purchased a new ATV, you may be eligible for Free Training. For a training center near you, call the nationwide toll-free number at (800) 887-2887 or visit their website. The Motorcycle Safety Foundation (MSF) DirtBike School provides hands-on off-highway motorcycle rider training with an emphasis on safety and skill development. For a training center near you, call the nationwide toll-free number at (877) 288-7093 or visit their website. The Arizona State Association of Four Wheel Drive Clubs, Inc (ASA4WDC) provides a 4x4 Safety and Awareness Program which is sanctioned under the United Four Wheel Drive Association (UFWDA). For more information, visit the ASA4WDC website. Youth ATVs are only intended for one operator with no passenger. Children should NOT ride adult ATVs. Parents are responsible for their children’s safety. Make sure your kids ride with only appropriate safety equipment. Visit theATV Safety Institute. There are ATVs designed for children. Always follow manufacturer minimum age recommendations and supervise children under 16. It's illegal to drive while under the influence of drugs or alcohol. Use your judgment and sharp reflexes while riding or driving. Don’t drive while under the influence of drugs or alcohol. The operation of an off-highway vehicle requires skill and good judgment. Drugs and alcohol impair both. You become a danger to yourself and others when you operate your OHV and take drugs or drink alcohol. Laws regarding DUI apply everywhere in the state, even if you are on a backcountry trail. And, the penalties are the same, including jail and the loss of your driver's license. It's dangerous and illegal! In an attempt to increase air quality and reduce pollution, portions of Maricopa County now restrict motorized vehicles on many unpaved roads and vacant lots. 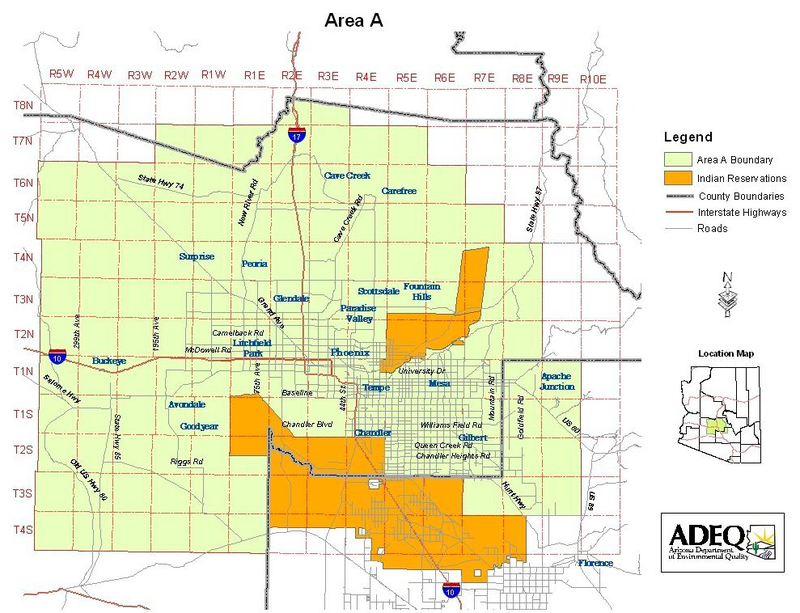 In an attempt to increase air quality and reduce pollution, portions of Maricopa County restrict motorized vehicles on many unpaved roads and vacant lots. Currently, portions of Maricopa County are designated as a serious nonattainment area with respect to federal National Ambient Air Quality Standards (NAAQS) for particulate matter less than 10 microns in diameter (PM10). New laws have been adopted across the Phoenix metropolitan area in response to air quality concerns. 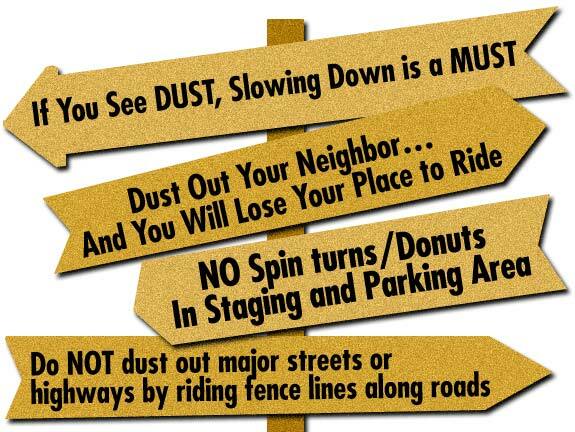 Cities in Area A now restrict the operation of motorized vehicles on many unpaved roads and vacant lots. Check with your local law enforcement or city office to find out if your recreational use is permissible. Visit the website here or here. Maricopa County is working to improve air quality. Everyone feels the effects of high levels of particulate matter in the air. Children, the elderly and people with heart disease, lung disease and asthma are especially at risk, but even healthy adults are likely to have problems. High pollution levels limit visibility and our ability to enjoy the scenery and activities so popular here in Arizona. To learn more about particulates, the effects, the offenders, and solutions visit CleanAirMakeMore.com. Teachers can also download Lesson Plans which meet Arizona academic standards and young people can join the Clean Air Kids Club. Fire Condition News for Most Land Agencies in Arizona: The latest fire news for most land agencies in Arizona may be found at the Public Lands Information Center (PLIC). Local conditions sometimes require land managers to close access or use of areas within their jurisdiction. ALWAYS check with local offices before venturing out on to Arizona's public lands. Check latest Fire News, Restrictions, or Closures. Bureau of Land Management Fire Restriction Hotline: For the most up-to-date fire restriction information for Bureau of Land Management lands, please call (602) 417-9373 or toll-free at 1-877-864-6985. During business hours you may call Explore Arizona Outdoor Information Center at (602) 417-9300, or visit http://www.azfireinfo.az.gov/. Please be EXTRA careful with fire every time you are on public lands. Arizona State Forestry Division: State and Private Lands: The Arizona State Forestry Division provides for the prevention and suppression of wildfires on state and private lands located outside incorporated municipalities. The Forestry Division accomplishes this mission through the use of cooperative agreements with local, state and federal agencies and other entities organized to prevent and suppress wildfires. To further enhance these capabilities, Forestry Fuels and Fire Crews are provided through the Arizona Department of Corrections. The Forestry Division is also engaged in Forest Management and Urban and Communities Forestry activities designed to enhance forest health. Check Current Fire Information. For fire prevention, a USDA-approved spark arrestor is required for recreating on land in Arizona. Spark arrestors work on the principle of trapping or pulverizing carbon particles with a diameter greater than 0.023 inches. The centrifugal trap-type arrestor is by far the most common design used by OHV enthusiasts. In addition to the requirement of certain efficiency levels, a trap unit must have a clean-out device. Various methods are used to clean accumulated carbon particles out of a spark arrestor. Some include a cleanout plug, end cap, cleanout plate, inserts, snap rings, cleanout bands, and Allen bolts. The spark arrestor must be serviceable without removing the complete exhaust system. The cleanout requirement is one of the most critical elements of the trap arrestor. It is also one of the most often ignored. During inspections, owners must be reminded that a spark arrestor requires regular and timely maintenance, a critical element of spark arrestor effectiveness. Some models of spark arrestors/mufflers require fiberglass packing. This packing should be replaced every 30 hours. Evidence of exhausted packing includes oil dripping from the exhaust tail pipe and/or excessive noise. Fiberglass is the only approved, qualified packing. The qualification standard requires spark arrestors to be permanently marked with the model number and manufacturer’s name or trademark. A USDA approved spark arrestor is required for recreating on land in Arizona. A spark arrestor inspection should be made prior to riding your OHV. Many people think that a muffler/silencer is also a spark arrester. Mufflers and silencers are only designed for noise control. Only an inspection can determine whether this is a spark arrestor or a muffler/silencer. If the OHV has been operating, beware of very hot metal in and around the exhaust system. The arrestor will be a chamber-like device located somewhere along the exhaust discharge. Find the manufacturer’s name or logo and the model number located on the spark arrestor. It may be necessary to clean a portion of the arrestor to reveal that information. It can usually be found on an attached metal plate. The words “Spark Arrestor” or “Qualified” stamped on a piece of equipment does not guarantee that it is a tested and qualified arrestor. Approximately 30 people die each year due to accidents involving mine land features. There are thousands of open mine shafts in Arizona. Please slow your speeds and keep a cautious eye out for mine shafts. Some roads/trails in Arizona were created by miners, and some roads were created without appropriate authorization from the land agency. Some roads/trails have a very deep open pit around the next turn. At one time, these abandoned mine lands were considered remote, but due to urban sprawl and the increased ability of the public to access these sites, accidents continue to occur. Many of these features are known to the public but are not reported to officials. Other times an abandoned mine feature is discovered by accident. Be aware!